Before 2013 JaegerMonkey had established itself as the leader of the pack (i.e. the superior engine in Spidermonkey) and was the default JIT compiler in the engine. It was successfully introduced in Firefox 4.0 on March 22nd, 2011. Its original purpose was to augment the first JIT Monkey, TraceMonkey. Two years later it had kicked TraceMonkey out of the door and was absolute ruler in monkey land. Along the ride it had totally changed. A lot of optimizations had been added, the most important being Type Inference. Though there were also drawbacks. JaegerMonkey wasn’t really designed to host all those optimizations and it was becoming harder and harder to add new flashy things and easier and easier to add faults. JaegerMonkey had always been a worthy monkey but was starting to cripple under age. The year 2013 was only eight days old and together with the release of Firefox 18, a new bad boy was in town, IonMonkey. It had received education from the elder monkeys, as well as from its competitors and inherited the good ideas, while trying to avoid the old mistakes. IonMonkey became a textbook compiler with regular optimization passes only adjusted to work in a JIT environment. I would recommend reading the blogpost of the release for more information about it. Simultaneously, JaegerMonkey was downgraded to a startup JIT to warm up scripts before IonMonkey took over responsibility. – Firefox 19 was the second release with IonMonkey enabled. Most work went into improving the new infrastructure of IonMonkey. Another notable improvement was updating Yarr (the engine that executes regular expressions imported from JSC) to the newest release. – Firefox 23 brought another first. The first compiler without a monkey name was released: the Baseline Compiler. It was designed from scratch to take over the role of JaegerMonkey. It is the proper startup JIT JaegerMonkey was forced to be when IonMonkey was released. No recompilations or invalidations in the Baseline Compiler: only saving type information and make it easy for IonMonkey to kick in. With this release IonMonkey was also allowed to kick in 10 times earlier. At this point, Type Inference was now only needed for IonMonkey. Consequently, major parts of Type Inference were moved and integrated directly into IonMonkey improving memory usage. – Firefox 25 to Firefox 28: No real big performance improvements that stand out. A lot of smaller changes under the hood have landed. Goal: polishing existing features or implementing small improvements. A lot of preparation work went into Exact Rooting. This is needed for more advanced garbage collection algorithms, like Generational GC. Also a lot of DOM improvements were added. – Firefox 29. Just before 2014 Off-thread MIR Construction landed. Now the whole compilation process in IonMonkey can be run off the main thread. No delays during execution due to compiling if you have two or more processors anymore. Great post. I love to read this stuff. I have a question about memory usage during Octane 2.0. Chrome uses at its peak about 250MB but Firefox easily reaches 500+MB. Why is this and could exact rooting and the optimizations it brings fix this? Why people have this obsession with low ram usage. Who works on IT and have a computer with less than 8 GB? That’s enough to run 2 VMs, a heavy IDE and a browser full of cat videos. I don’t care about RAM usage, I care about proper RAM cleanup, fixing ram/cpu leaks and such. I too work on a machine with 2Gb ram. I suspect you don’t have much business experience. Most companies use their existing workstations as long as possible. At least until the warranty expires. When it is time to buy new they don’t purchase the latest and greatest workstations, most powerful. They get just enough of a machine to get the job done. The latest iPad has only 1 GB RAM. Firefox OS phone has only 256 MB. And memory cost and speed are not improving much these days even on PCs. It is a valid concern, a Firefox OS device has 512 MB of RAM. And cheap laptops 2GB. That’s great for folks in IT. Somehow I thought Firefox was for more than just those folks. On Windows, Firefox is probably still a 32bit application, that limits it to 3GB of ram (1GB is reserved for OS mapped memory). While there was work on child content processes, it still means that a page or complex system of pages is limited much below 8 GB. Further, there are lots of normal computers running Windows with 4 GB (or less) ram. On a 64-bit OS, even 32-bit applications like Firefox can access the entire 4GB. On a 32-bit OS, applications can only access 2GB by default. There was a hidden setting you could change in Windows that would expose a 3rd GB, but it’s unsupported and the vast majority of users won’t take advantage of that. Firefox does have a 64-bit application called nightly. What a weird reaction. If chrome can do the same in less memory why not? I have to use 64bit Firefox because I often go over 2GB of memory usage. Firefox becomes slower and slower the more memory it use. At 2GB it becomes unbearable and I have to restart it. Please put your comment in the “640K is enough for everybody” bucket. There’s definately more work going on to reduce memory use (driven mostly by low memory FFOS phones. not 640K by < 200MB). Although typically we do much better than Chrome, and leaks like the ones you describe should be pretty rare now (in all the metrics I've seen at least). You might try removing extensions to see if any of them are being bad citizens. When you go to the Computer Science school there is a thing called “efficiency” and a program that print “Hello world” and needs 16gb of ram isn’t efficient enough. Thats the reason everybody cares abot low ram usage, to avoid such things. That’s but a modern browser is pretty much as far from a hello world as you can get. To the point, recent ff should be very efficient. If you’re having issues with memory create a new profile to see if that fixes things. If it does then it is probably an extension (though it could be other things as well which is why creating a new profile is the easiest way to diagnose, and fix, the issue). To the author: is there any chance of Yarr being replaced with a more efficient regex parser? Iirc, that’s an area where ff often trails chrome pretty consistently. I care! And I work in “IT”. I Have got 2GB of ram on my Work PC (WinXP) and 2.5 GB on my personal laptop which runs Debian. Mozilla does track the usage and other technical data for improving the experience. One of the coming optimizations that will probably decrease peak memory will be Generational GC. 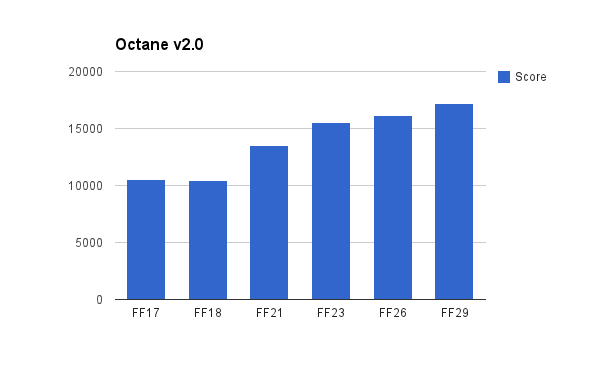 On http://arewefastyet.com/#machine=14 (GGC on FirefoxOS) we see an improvement in octane 2.0 and this is mostly caused due to decreased memory usage. We don’t have to invalidate scripts as often to free memory and can run more in IonMonkey. Hrm. Why is there such a big difference between the gap in GGC numbers and normal when compared to the numbers at the default http://www.arewefastyet.com/ ? That’s because GGC can handle the low memory on FirefoxOS better than the normal IGC currently shipped. On desktop (the results you are referring too) there is enough memory available. That’s why there is less of a gap on desktop. Technically we need more garbage collections on the FirefoxOS due to the constraint memory. A garbage collection removes Type Information and as consequence all IonScripts. So we are kicked out of IonMonkey and need to warm up before we can run again in IonMonkey again. 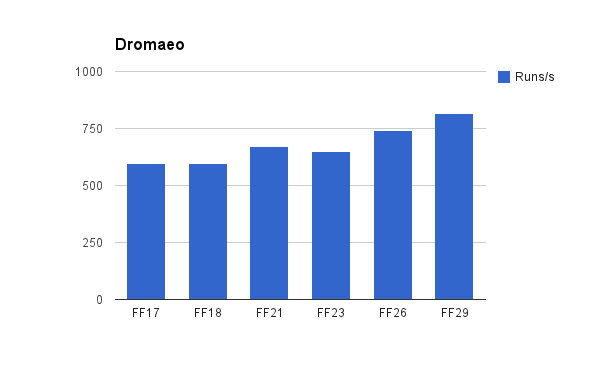 As a result FirefoxOS will run more in baseline and therefore be slower. Now GGC needs less garbage collections. So we can run more in IonMonkey and we will be faster. If we would crank up the the available RAM on the Unagi (the device tested on arewefastyet) to 2gb, there wouldn’t be such a big gap between GGC and IGC currently. Gah! Why does GC kill compiled scripts? Shouldn’t that only occur in response to a memory-pressure event rather than a standard GC pass? Is there an issue with monkeypatching addressing in the generated code after a GC run? Because actual workloads are weirdly bursty. Half of all loaded code never runs, and the vast majority isn’t worth compiling because it doesn’t run enough. Neither of which is relevant to your question. But the stuff that *is* hot doesn’t stay hot forever, so you accumulate compiled code that you aren’t really using. It’s possible that unnecessary ICs build up over time too; I’m not sure. And yes, we patch lots of different addresses. But really, I don’t know the answer. As in, why not keep track of hot scripts and avoid throwing them out? I dunno. Maybe the type sets get bloated or something. The reason is TI. Currently (actually not anymore) we couldn’t remove TI from one script only. It was remove everything or nothing. Since IonMonkey uses TI information and that information is invalidated during GC, the ionscript must get removed too. I LUV reading this stuff, too, even though I don’t understand the majority of it! I’m just a simple consumer who loves knowing there’s a browser out there that truly cares about our privacy and protection. THANK YOU!!! Yeah, then we could get a shirt! I think for now we will stick with maximum 1 core handling compilation. This drains less battery power (e.g. for laptops, tablets, phones) and also interferes less with running code. Can we yet adjust based on the current plugged in state and perhaps other relevant hardware factors? I find Chrome to be quite the memory hog (on OS X). It’s just not that obvious because it’s using so many background services, so the Chrome application looks slim in RAM usage, but if you add up all the other background tasks that Chrome is running, it never runs with less than 1GB RAM usage. Firefox on the contrary tends to start of using around 500MB of RAM and doesn’t bloat as quickly and badly as Firefox (or Safari for that matter). i am so glad, at the age of 34, i am starting school again. i say this with pseudo contempt. this fall, a tech school based on web design/networking, all of my knowledge, self taught, all of my typing skills, with two fingers. this time next year i may finally understand what the heck you guys are talking about. may the force be with me, along with capital letters and less commas. what does the firefox say? Been developing a 3d voxel engine. My latest creation is a 3d sand simulator (cutting edge), on FireFox I am maintaining a 60fps sustained output. Far beyond any other browser, watch this space! Nice to meet you! – In case you need french, spanish or any other language, I will be glad to help you! Mozilla is one of the best – I would even say: the very best in the globalized world – no boundaries, freedom, information… just terrific !!!! The only problem with firefox is that it takes a lot of time start, if by any means you could fix that then it will be the best Web Browser Ever! Congrats! I always was on firefox side! Now you need to build FF engine based NodeJs!!! Yahoooo! For those who said chrome take less memory, just check chrome task manager and you will be amazed how much it uses memory actually. On my pc only stupid chrome Graphics process takes 1.5 Gb only for two ~ three tabs opened. I do not know is it a bug or what, but that Firefox stable compared to webkit based browsers as a bulldozer is true. Chrome crashes every session, but firefox can stay day by days smoothly just working. I am not a programmer, but really enjoyed that explanation of what is going on. Thanks!